The increased popularity of rosé, making #DrinkPink, #YesWayRose and #Brose trending hashtags all over the world, has also made a huge impact on sparkling wine. Sales of rosé champagne have sky rocketed in recent years opening the market to many new world wine brands. Who produced the first sparkling Rosé and when has been hotly contested by Champagne houses for many years. Documents uncovered by historians at Champagne Ruinart discovered records stating the first sales of their Rosé champagne dated 1764. Before this, it was believed the first was Veuve Clicquot in 1775. Usain Bolt has been appointed CEO of Mumm (Chief Entertainment Officer), bringing a new meaning to their motto ‘Dare. Win. Celebrate.’ Being involved in the sporting world is nothing new for the Champagne house. Maison Mumm celebrated in South Africa during the Sun Met, Africa’s richest horse racing day, is the official Champagne for FIA Formula E electric street race in Montreal and hosts the Melbourne Cup Carnival in Australia. G.H Mumm Le Rosé NV Brut is a blend of the three dominant grape varieties of Champagne, Pinot Noir, Chardonnay and Meunier. It is a beautiful pale salmon colour with a golden hue, it has an abundance of vigorous tiny delicate bubbles. The elegant aromas of strawberry, raspberry, apple and citrus blend harmoniously with the understated autolytic characters and there is an almost savouriness to the nose. Flavours of red berries and crisp apple are heightened by the acid structure of the wine. There is a chalky minerality on the stunning and a little surprisingly dry finish which leaves the palate refreshed and wanting more. This is a very unique Rosé Champagne. With some of the best and most recognised New Zealand Methode Traditionnelle wines hailing from the Marlborough region, Allan Scott is certainly in good company. The well-known wine region produces elegant and structured wines with a crisp acidity that is needed to produce an outstanding sparkling wine. Allan Scott’s cellar door and restaurant are the perfect place to experience not only the delicious sparkling wines but their entire range of estate wines. Cecilia Rosé Methode Traditionnelle NV is made from 100% Pinot Noir and the wine has three days of skin contact to develop colour in the wine. It is a very pretty shade of pale pink with a salmon hue, the fine bubbles rising steadily to the surface. Aromas of ripe red berries, strawberry and raspberry and crunchy red apple dominate and are accompanied by rose petal, blossom and brioche following close behind. A blend of red cherry, raspberry and strawberry on the palate emphasized by the same vibrant acidity found in the Brut, the chalky note is also prevalent and the wine has a lovely long finish where the fruit remains the star of the show. Founded in 1812, the house was first owned by André Michel Pierlot and then sold to Marie-Louise Lanson de Nonancourt in 1939. In 1945, Marie-Louise’s son Bernard de Nonancourt began an intensive apprenticeship, learning every aspect of winemaking from vine to cellar, he was then appointed Chairman and Chief Executive in 1948. I visited the Champagne house in 2015, after a tour of the estate bottling plant and the incredible cellars that are weaving below the ground, I enjoyed an extensive tasting in the parlour. 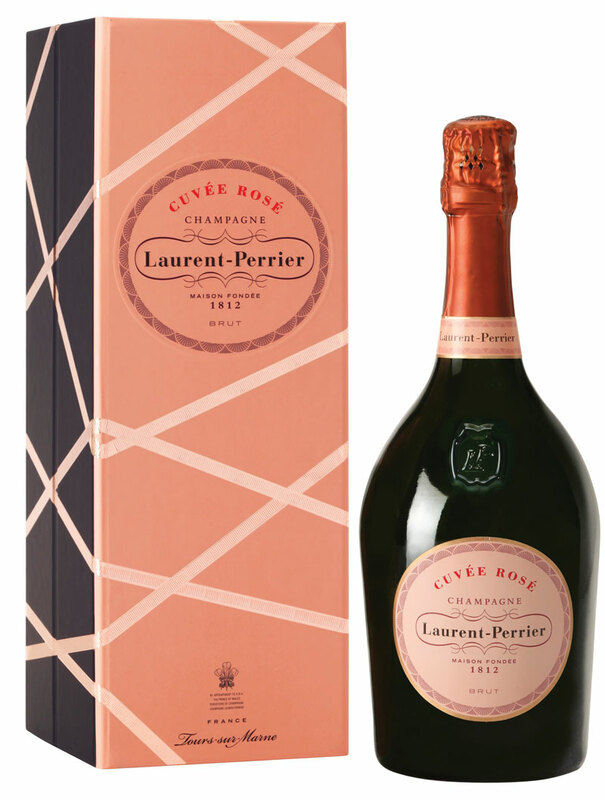 Laurent-Perrier Cuvée Rosé NV is one of the most popular Rosé Champagnes in the world, it is made from 100% Pinot Noir taken from 10 cru’s throughout the region. The juice is left on skins between 48 and 72 hours to extract the colour and flavour needed for the finished wine. A beautiful salmon pink colour with a very fine and persistent bead, the aromas of freshly picked cherry, raspberry and strawberry intertwine with biscuit and freshly baked bread and finish with soft florals. The palate finds intense and elegant red fruit, giving the wine depth and structure with mineral and pretty rose petal notes to follow. The delicate mousse and cleansing acidity linger on the palate long after the wine is gone. Previously a successful restaurateur in Wanaka and Auckland, Angie is now a well-known personality in the wine industry having spent the last 10 years in wine sales working with many outstanding New Zealand and International brands. She is a Certified Sommelier CMS and a WSET Diploma graduate who is passionate about all aspects of the wine industry. Oysters and Champagne are a classic wine and food match, but Rosé Champagne can be matched with so much more. It is perfect with prawns, tuna, salmon and even duck. Sparkling Rosé has the complexity and the weight to match with these dishes and the acidity to “cut through” the richness. My favourite match is with a plate of truffle ham at Apero on Karangahape Road in Auckland, absolutely delicious!